A stomacher is a decorative panel of fabric, usually triangular in shape, worn to fill the space between the front edges of a woman’s open gown. 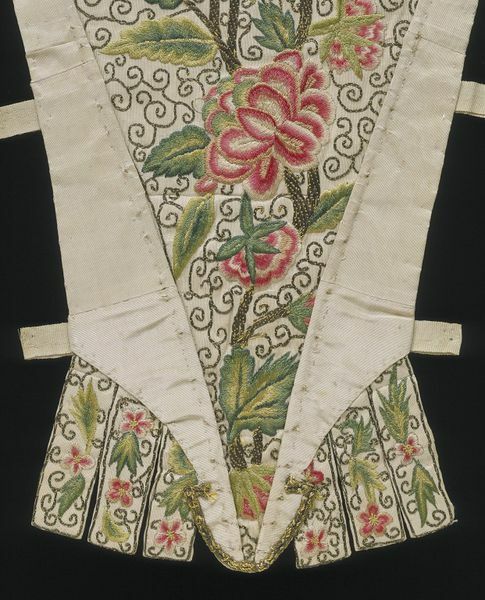 The stomacher formed part of the ensemble of fashionable women’s dress from the 1680s to the 1780s. This example is rather inelegantly shaped and has been pieced together with scraps of silk. Nevertheless, the carefully shaded petals and leaves have been skilfully embroidered and the tabs were worked to shape. The pinholes in the tabs on either side indicate how it was attached to the gown. 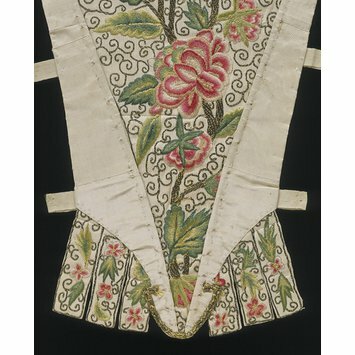 An ivory ribbed silk stomacher, pieced in several places, embroidered with partially wrapped silver thread, coloured silks. In the middle within a V-shaped space formed by two overlaid pieces of silk is a flowering rose-stem on a ground closely covered with scrolling stems. At the bottom are six narrow strips filled with floral stems. The lining is of cotton, printed in red with vertical stripes containing small detached flowers and dots. Length: 12.75 in, Width: 9.5 in max. Purchased. Registered File number 17245/1902.